The French for burden (with) is the regular ER verb grever. To remember this, imagine a chef is burdened with GRAVY. Grever can also mean: to be a burden on, to put a strain on. - pesant (adj) : burdensome. - le fardeau la charge (nm/nf) : burden. - s'embarrasser de (vr) : to burden oneself with, to weigh oneself down with. -evrer add a grave accent to the mute letter e (è) before a silent syllable. This changes it to an open sound. Examples of this family of verb conjugations: mener, emmener, remmener, ramener, parsemer de, achever, grever. Don't be burdened with tedious methods, learn French with innovative techniques like Cartoon Memory Triggers. To remember a word, just think of the pic! 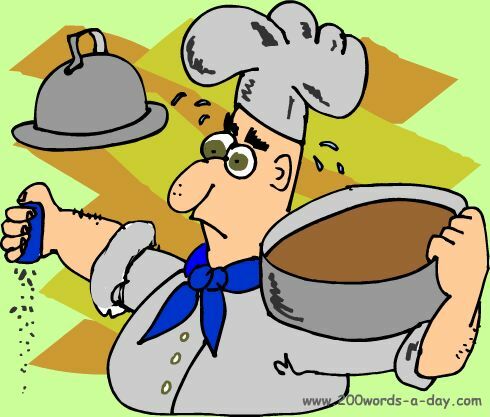 Imagine a chef is burdened with GRAVY! burden! grève ! grevons ! grevez ! ✔ grever is a regular ER verb. There are over 5,000 ER verbs these being the most common verbs in French. ✔ Learn grever and it will reinforce the pattern for ALL those other ER verbs. ✔ You can more easily remember words and verbs like the French verb grever - French for burden (with) - using the techniques of the world's Memory Masters. 200 Words a Day! Free Daily French Lesson Online - the verb in French verb grever - French for burden (with) - fully conjugated. French Learning Made Fun and Fast with your free Daily French Verb Lesson - grever.